I've been meaning to put this recipe up on the blog, as it's always in my weekly rotation in some form, especially during spring and summer. It's crunchy, tangy, savory and all together just one big sheet-pan of yum! Bloggers and home cooks alike are obsessed with sheet-pan cooking these days and rightfully so! The clean up process is easy and you can use the same sheet-pan for both roasting the broccoli and baking the pasta, with no clean up needed in between (yippeeeee!). Oh, and you'll want to serve this pasta right on the pan so everyone gets equal access to that crunchy top layer. This recipe was inspired by this NY Times recipe, they also have a great list of summer pasta ideas here. This is a modern alternative to a traditional pasta bake and guests are always interested in the presentation on the sheet-pan, which provides a good talking point for a dinner party. You can prepare this dish in advance and then pop it into the oven just before serving. It can be enjoyed right out of the oven or served at room temperature, making it a great companion for a pot luck or BBQ. Make this pasta either vegetarian or vegan by adjusting the "ricotta" and "parmesan" ingredients. I've had it both ways and you can't go wrong. Preheat the oven to 450 F/230 C and bring a large pot of salted water to a boil. 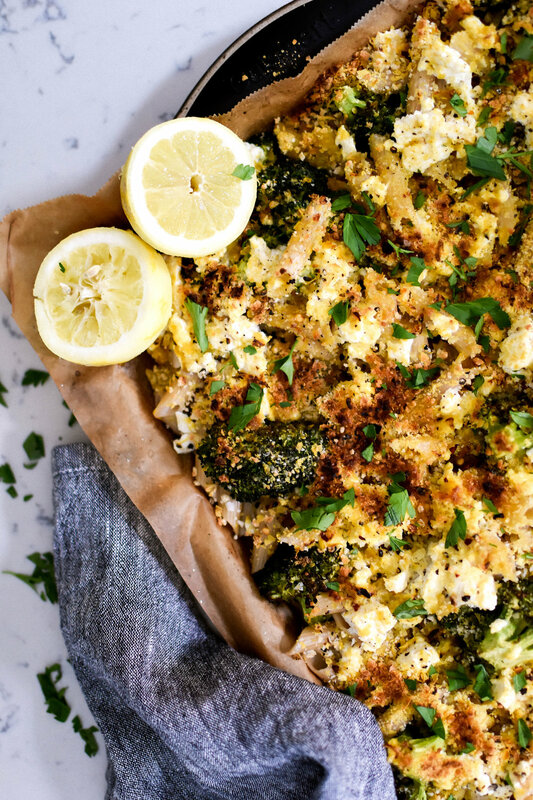 Meanwhile, prepare the sheet pan with parchment paper and toss the broccoli directly onto the pan along with two tablespoons of olive oil, cumin and salt and pepper to taste. In a small bowl combine the bread crumbs, nutritional yeast or parmesan, lemon zest, red pepper flakes and salt and pepper to taste. When the oven is ready, cook the broccoli for 20-25 minutes, rotating halfway in between. Cook the pasta as directed. Toss with a bit of olive oil to keep it from sticking together while it waits in the strainer for the broccoli. When the broccoli is lightly browned but still holds its bright green color, remove it from the oven. Turn up the oven to 500 F/260 C. Add the pasta directly to the sheet-pan along with the broccoli and mix it all together. Dollop the ricotta, or ricotta alternative, on top of the pasta and broccoli and sprinkle the seasoned bread crumbs over the top. Drizzle with a generous amount of olive oil and place the pasta in the oven for about 10 minutes, rotating halfway in between, until the top is browned and crunchy but not burnt. When the pasta is ready, remove it from the oven and pour the lemon juice over the top (to taste) and sprinkle with chopped parsley. Serve directly from the sheet-pan along with extra parmesan, or parmesan alternative, and red pepper flakes on the side. *Jovial is my new favorite type of GF pasta. It's made in Italy so 'nuff said! They stock it at most Whole Foods or specialty grocers. **If you are making this dish dairy-free and can't locate the Kite Hill Ricotta, you can use organic tofu instead. Just make sure to drain out the water for at least 30 minutes, and crumble it using your hands to make a ricotta-like consistency.